The University of California, Davis was selected to receive a $2.2 million dollar award from the U.S. Department of Energy Solar Energy Technologies Office (SETO) to advance solar technologies. 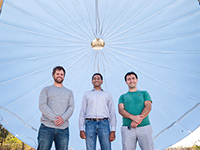 UC Davis will advance concentrating solar-thermal power (CSP) research and development. CSP concentrates incoming sunlight to heat that then generates electricity like a power plant. In CSP technology, solar energy is concentrated using mirrors and directed at a receiver. A heat transfer fluid, such as molten salt, flows within the receiver and absorbs heat from the concentrated solar energy and passes this energy on to a working fluid of a thermodynamic power cycle. CSP system components must be able to withstand high-temperatures. Projects selected by the DOE will develop materials and designs for collectors, power cycles, and thermal transport systems that can withstand temperatures greater than 700oC while being corrosion-resistant. Next generation CSP systems operating at higher temperatures will be able to store more heat and dispatch solar electricity at any time day or night. A commercial CSP power plant in California on the border with Nevada. 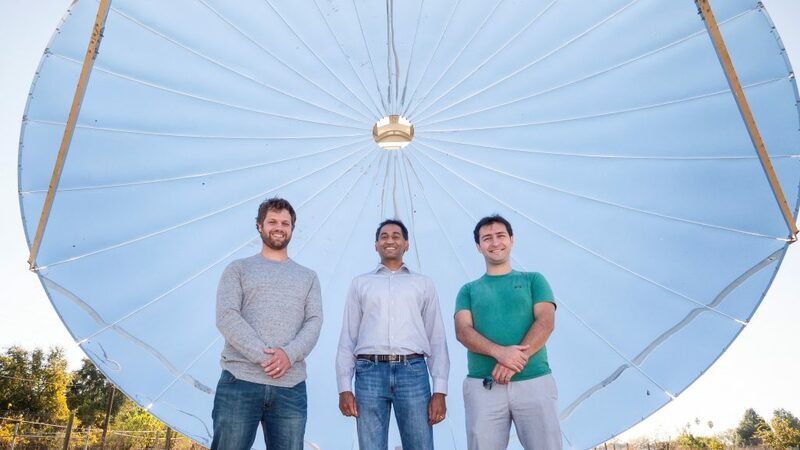 The UC Davis team will develop a novel additively-manufactured high pressure heat exchanger applicable to CSP plants. Specifically, researchers will develop a heat exchanger that transfers heat from 720 oC molten salt to a high-pressure working fluid, supercritical carbondioxide, slated for use in the next generation of solar thermal power plants. Their approach includes corrosion characterization, thermofluidic experimentation, cost modeling, and market transformation. The team consists of researchers from UC Davis, Carnegie Mellon University, National Renewable Energy Laboratory, and four companies. The lead PI of the project, Professor Vinod Narayanan, is a faculty member in the Department of Mechanical and Aerospace Engineering and Associate Director of the UC Davis Western Cooling Efficiency Center. Vinod Narayanan, Caton Mande and Efran Rasouli at the UC Davis experimental facility that will be used in this project. “We are excited to develop this key enabling technology of the supercritical carbondioxide solar thermal power cycle through multi-faceted research in heat exchanger design and modeling, advanced manufacturing, and material science and engineering” said Narayanan. UC Davis was selected as a part of the Energy Department’s FY2018 SETO funding program, an effort to invest in new projects that will lower solar electricity costs and support a growing solar workforce.